MachineControl software enables you to easily integrate and control external audio/video devices via industry-standard serial 9-pin machine control protocols. With MachineControl, fast forward, rewind, jog, shuttle, and other common tasks are easily accessible through the Pro Tools graphical interface. Digidesign MachineControl software offers track-arming for integrated laybacks to external transports. Digidesign MachineControl software offers track-arming for integrated laybacks to external transports. MachineControl also allows you to slave Pro Tools to compatible Sony 9-pin devices, allowing your Pro Tools system to emulate a remote deck. It supports serial time code as a positional reference and features faster lockup times to Sony 9-pin. With Pro Tools 5.1 and higher software, MachineControl allows you to remotely control Pro Tools from external controllers via industry-standard Sony 9-pin commands. Both music and post-production studios benefit from the ability of Pro Tools to emulate a remote deck. MachineControl allows for scrubbing of audio and video simultaneously from within Pro Tools. Check your audio and picture sync quickly and efficiently using the scrub-to-picture feature of MachineControl. The transport window provides enhanced feedback for the various control modes, including displaying the difference between Shuttle mode and true Rewind or Fast Forward modes. With Transport-Machine mode, the Pro Tools positional cursor will follow the machine's time in Fast Forward or Rewind, showing you the relationship between the external deck's time code and the session. MachineControl also provides intelligent logic that will tell Pro Tools if a machine's local/remote mode has been changed from its front panel, eliminating communication problems that may otherwise occur. MachineControl also offers track arming with insert and assemble recording. 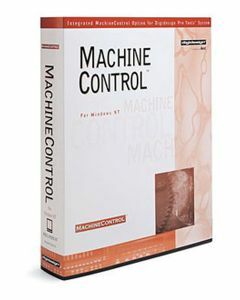 MachineControl auto-detects many commonly used transports and presents the appropriate track configuration to the user for intuitive, integrated laybacks to master tapes. When used with Pro Tools 5.0 or newer software, MachineControl supports serial time code as a positional reference and features faster lockup times to Sony 9-pin.